I saw the film Anvil a few nights ago. It’s a documentary about a rock band who, thirty years on from being on the verge of greatness, are living in near-obscurity and decide to give it one last push before giving up for good. It’s an absolutely brillant (and hilarious) film and I was incredibly touched by their perseverance, their passion and their lust for life. And it reminded me that perseverance is that rare quality that is usually the one factor that many people are missing out on when looking for success. I often advise people on small business and creative industries, and tell them to look at the top DJs and producers in the world: Carl Cox, Pete Tong, Sasha, Roger Sanchez, Eric Morillo, The Chemical Brothers, Fatboy Slim, The Prodigy etc – I’m fairly certain that not one of them is under 40, and I know that some of them are over 50. (edit – I’m reliably informed by Ian -see comments below- that Liam from the Prodigy is a spritely 37). The average age of the freshest, hottest 3 DJs in the world (Tiesto, Armin van Buuren and Paul van Dyk) is 37.2. We’ve recently announced details of Ignite Cardiff #2, and with that in mind I thought I’d link to this article explaining how to “Deliver a Presentation like Steve Jobs”. 14 Tools Of Highly Effective Twitter Users – I particularly like the first tool. I’d be more inclined to find out how annoying I am though, rather than vet others before following…. This looks quite interesting if you’re based near South Wales and are in the creative industries, innovation, enterprise etc. I’ll probably be there. This link is either the greatest link ever for a procrastinator, or a fascinating archive of the things that amused us over the early years of “the internet age”. Very interesting take on what’s “killing” the music industry. Not illegal downloads, according to the author. Surprised to see that the value of music being shipped is more today than it was in 1993. My Dad’s been very ill recently, and I’ve been “hanging out” at an online forum where people exchange experiences and support about the illness that he’s suffering from. One post struck me as absolute gold: A woman has become very housebound and insular in the last year, not wishing to leave the house. But in the recent snow her husband and kids persuaded her to go out and make a snowman with them. The phrase that convinced her to get out there? “Let’s go make some memories“. Life is short, and all we really have at the end of it is our memories, so go make some. * The pic at the top is of my girlfriend and I, mid-jump, making some snowy memories a few weeks ago. 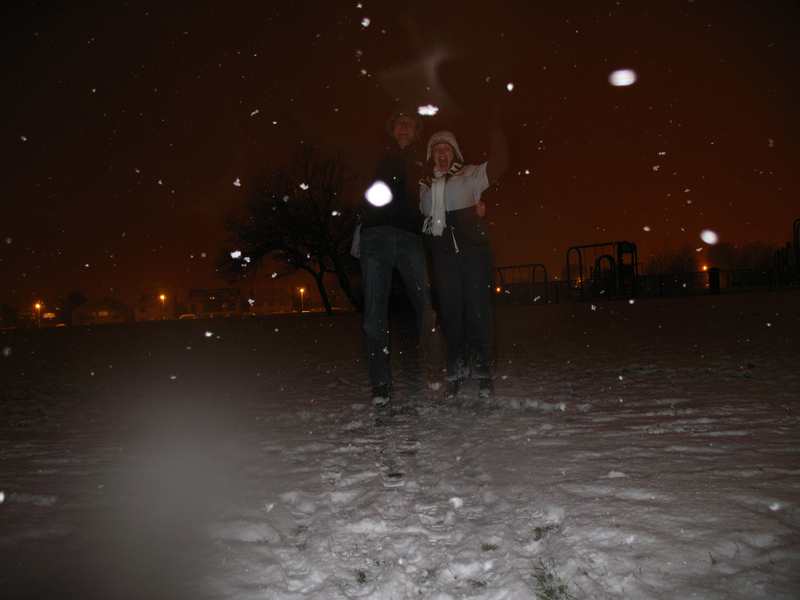 That blurry shot is the best of about 15 attempts to get a shot of us mid air in the snow, using a self timer! I take your point about perseverance Neil but a lot of the DJs you mention above became quite successful at an early age .. and they’re still hanging around. In fact, in a lot of cases, it’s because they’ve been around forever that they’re still affforded any respect at all. I think we need a cull ..
Liam Howlett is still only 37…and the prodge took off when he was 19! Thanks Ian – i forgot Liam was such a whippersnapper. I’ll amend now. Expletive Undeleted – True, I agree some of them have been around “forever” (and a cull may be long overdue!). But they had been at it for a long time even before their big break or rise to prominence. I liked the Steve Jobs thing. Now I’m going to do my best to forget it and just be myself! Previous Twitter – What’s the point?